Even though the retro style is something that has been taken from the past, it still works when applied to the present. Just like the vintage style, retro never fails to attract people and it is mainly due to its attention-grabbing features including the colors, shapes, and overall design. The retro style can be applied to graphic designs, fashion, and interior design, you name it. Here, we’ll be focusing on incorporating the retro style towards graphic design, to be specific, ticket designs and templates. 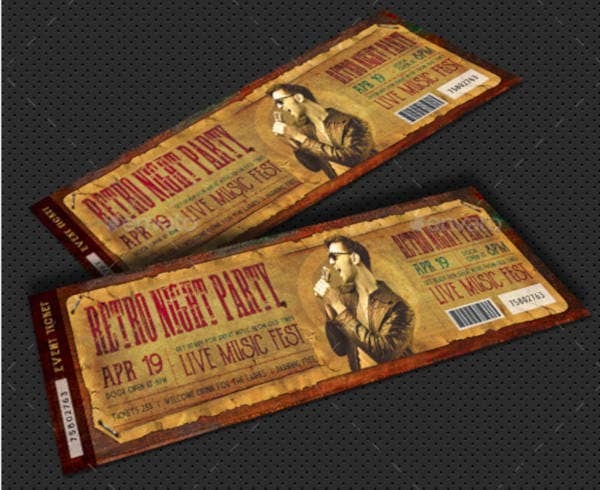 Whether you’re planning a retro-themed event or you simply love the look of retro designs on a ticket, these retro event ticket templates would probably be what you are looking for. There are around eleven designs below to choose from, see them yourself by scrolling down. The vinyl records are slowly making a comeback among the music lovers, with some actually playing them on their own record players and others simply adding them to their personal collection of vinyl records. The great thing about this resurgence of the vinyl records that even the artists of today have released record versions of their albums. You can also read vintage ticket templates. With this retro-inspired ticket design, it brings back memories of the good old times, back when music still made a lot of sense and was composed wholeheartedly. If you’re organizing a music party, then the template above would be a good choice. Halloween is fast approaching, and while the children are busy trick or treating around the neighborhood, there will be also a number of scary-themed events held during that occasion. If you’re planning to host a Halloween event, then it would probably be best to make use of tickets to monitor the number of attendees. 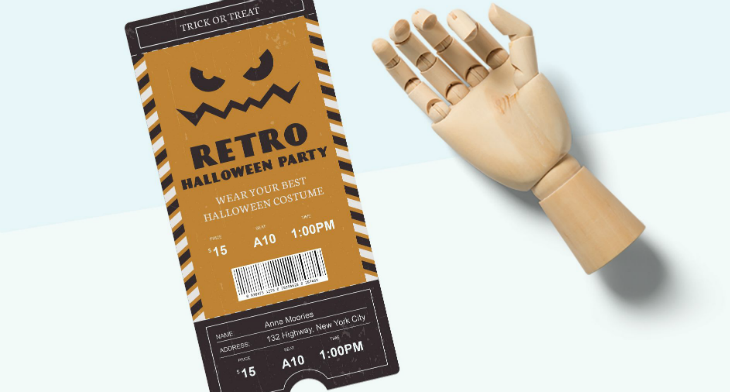 Lucky for you, we may just have a party ticket template specifically designed for that purpose, and this template even has a touch of retro-added to it. As you can see from the image above, the design is quite simplistic and focuses more on the textual elements, but it also has an image of a Jack-o’-lantern’s face to add a little bit of creativity. 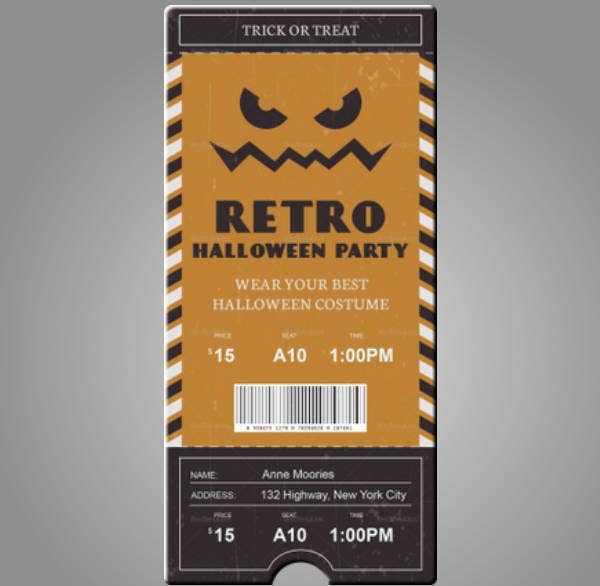 Looking for a retro-inspired printable ticket template that you can use for various purposes? You may want to use the one shown above. If there’s one thing you would notice from this template, it’s the use of mostly textual elements on the design, which makes this template perfectly versatile for any purpose. If you choose to download this template, you will even be given the choice between two styles. Yes, aside from the rustic retro style, you will also be provided with a cream retro style with exactly the same elements, the only difference is its white background. 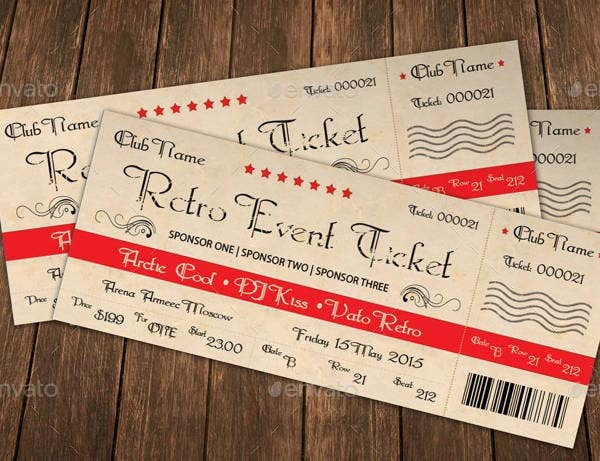 Here’s another easy to edit retro ticket template that you can use for any type of event. You may be organizing a movie event, a talent show, or anything you have in mind, this template will be a good choice. While the template design seems like the reason why it stands out, but there’s actually a better reason for it. As mentioned earlier, this template is indeed very easy to edit that you can change any of its elements with only a few clicks of the mouse. Feel free to download it and use it for all your events. 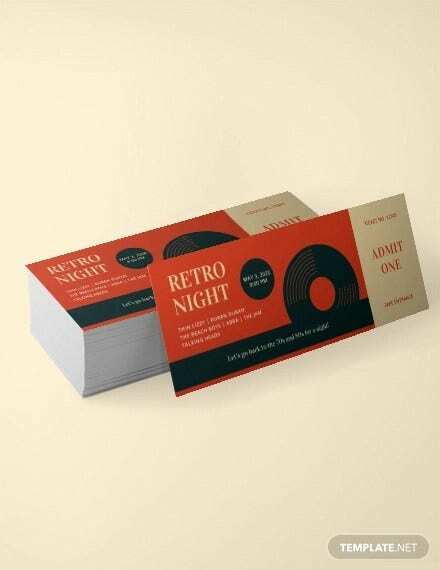 Here’s a retro-themed ticket template that you might want to use if you are organizing a live music night party. This ticket template also has a touch of rusticity to it, consisting of various layers that help to make it appear like more than just a design printed on a piece of cardstock. The design on this template shows a slightly crumpled-up paper stapled on a wood-like surface, and on this paper layer are the details of the event as well as the graphical elements. Among the other ticket templates that you can find in this article, you will notice that most of these templates make use of a minimalist design and color scheme, except for this one. This ticket template makes use of a honeycomb pattern for its background, with each hexagon-shaped cell having a different color. Over that background are the text indicating the details of the event. And to make the design appear retro-like, the text has a slightly faded effect to make it appear worn out. Whatever event you are trying to put together, this colorful retro ticket template would probably be a good choice. 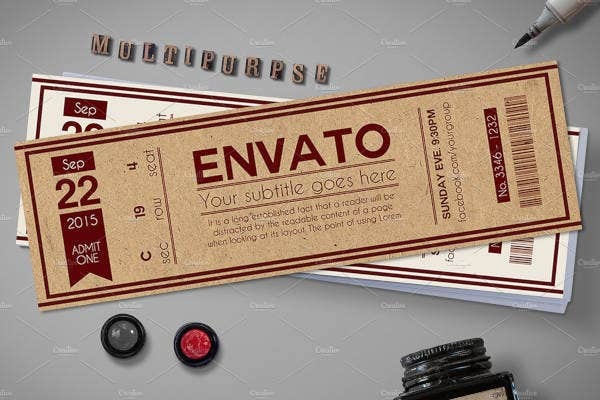 You can also check out attractive vintage ticket templates. Attract people with discounts, people love it when discounts are applied. What this means is that people will be able to get their hands on the ticket for a lower than usual price. When giving discounts, make sure that the price drop is substantial enough to entice people to buy tickets, but not too much that it will no longer become profitable. You may also see vintage ticket designs and templates. Look into the attendees from past events and prioritize them to give you a head start. This is called re-targeting and is actually meant to re-target not only previous customers but also those who simply inquired or have visited your website. If you have impressed your audiences during the past event, then you definitely get a head start if you reach out to them first. You can also read ticket invitation templates. Do pre-selling of your next event during the previous event, but this is only applicable when a lineup of events have already been set. If so, then it would be a good idea to start promoting your next event to those in attendance, they will be able to know about the event way before others. You can also see sample ticket templates. Are you a fan of John Wayne? How about Clint Eastwood? 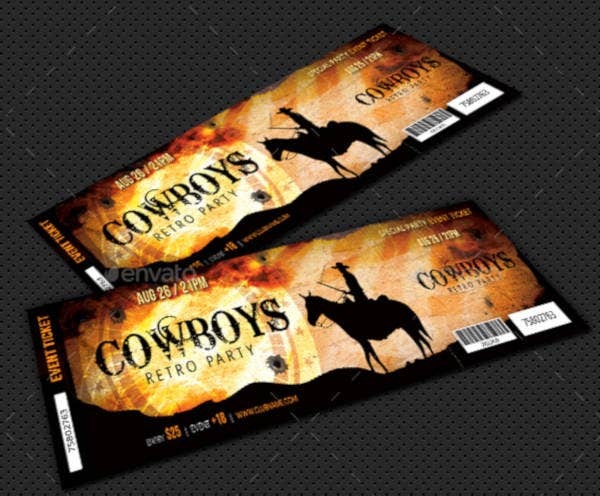 If you know somebody who’s an avid fan of either of them or who loves Western movies and you wish to throw a party in their honor, then you now know where you can find a retro ticket template for cowboy-themed parties. You may also see free ticket templates. The design on this template basically resembles a horizontally-long movie poster for an actual Western film, complete with background effects and a silhouette figure of a cowboy on a horse. This template comes in PSD format, which means you will need to have Adobe Photoshop installed on your computer to be able to edit this well. 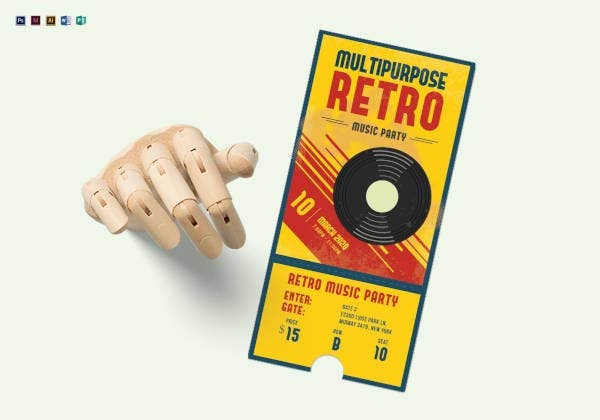 Here is another multipurpose retro-inspired event ticket template for those looking for more choices. While this template offers two styles for the price of one, the designs on both are very straightforward and simply put emphasis on the details of the event rather than on graphical elements. Whatever event you have up your sleeves, it would probably be a good idea to play safe and use this template for making your tickets. A design can look retro due to various factors: it could either be the images used in the design, the color scheme, or the choice of font applied. 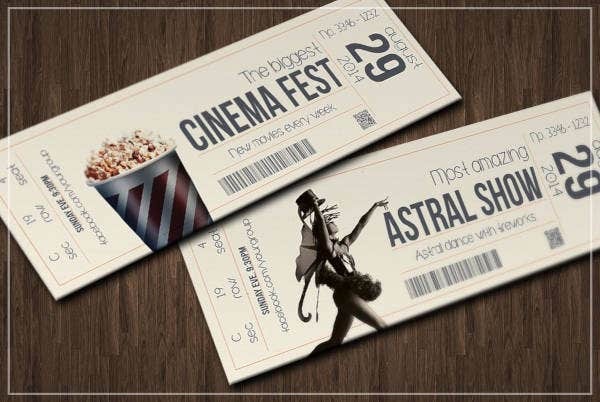 For the ticket template shown above, it makes use of a rustic-colored background and a classic font style to help make the design appear retro, and it actually works great. You can also see printable ticket samples. If you choose to download this template, you’ll be given a high-quality, fully-layered PSD file that’s editable and ready to print. Other than that, you’ll also be able to get your hands on the fonts Galeria and Myriad (the fonts are shown on the image) for no additional charge. 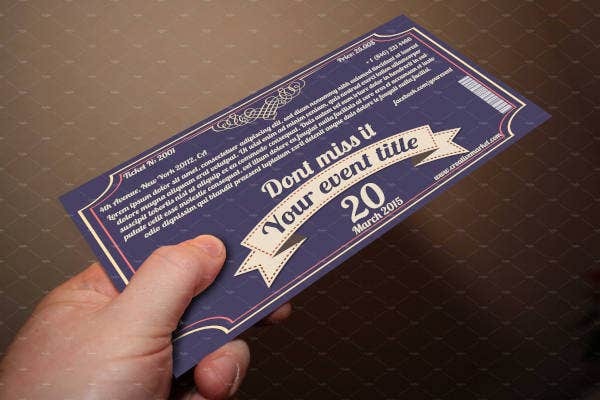 You may also see stunning event ticket templates. Want to organize a retro music party? 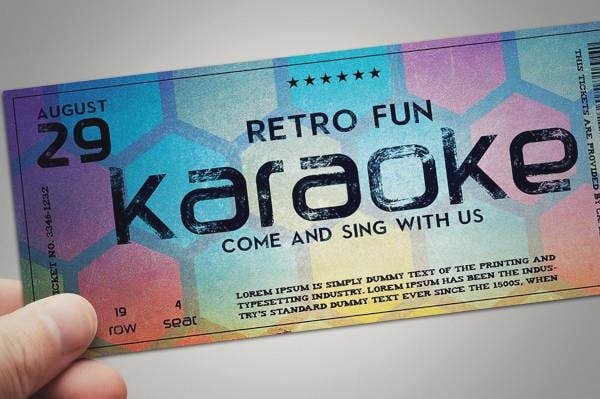 Then this retro-inspired typographic ticket template would be an awesome choice. However, do you have a different kind of party in mind? This template would still be an awesome choice because its simplicity makes it perfect for any type of event. You may also see blank ticket templates. The template basically appears like a cutout from a cardboard box, printed with the name of the event in the middle and a sole graphical image beside it. If you think this ticket layout works for you, then you may take inspiration from the examples or mock-ups provided on the website. What Is the Retro Style? The retro style is basically a style that is derived from or imitates trends, modes, or fashion sense of the past. The term retro is used to describe styles and themes of the previous generation, but they are not as old as the vintage style, they are simply those that have been overshadowed by the newer, more modern style. There are actually various types of retro styles, namely: retro objects, retro interior designs, retro typography, retro graphic design, retro art, and retro fashion, though there are still many other types of retro out there. 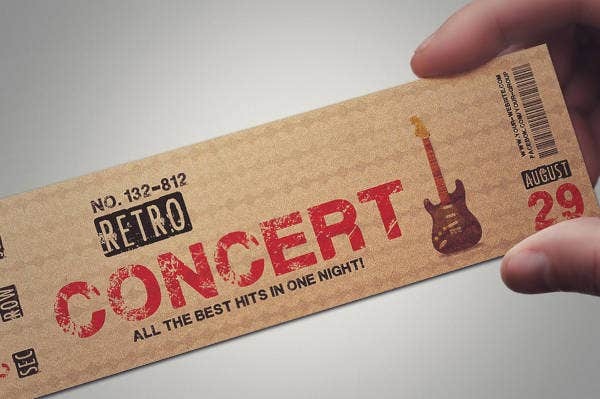 For the last retro ticket template that we have in this collection, this one is also something that would bring some nostalgic feel to its holders. Why? Because the design bears an image of a cassette tape. While vinyl records are already starting to return to the limelight, the cassettes are very rarely seen nowadays. You can also read meal ticket templates. Before compact discs became such a hit, cassette tapes were the main medium used for recording and playing music, and it had its ups and downs. But enough about cassettes, check out the retro ticket template above, the colors and text can be easily edited, and the template also comes with free fonts.